Menstrual Migraine Headaches - What To Do? Home remedies for menstrual migraine headaches are often the first treatments tried. These can be as simple as using a cool wet compress on your forehead or an ice pack on the back of your neck to relieve the pain. Home remedies can also include lifestyle changes, and a switch to a migraine headache diet to eliminate any other possible triggers. Some herbs that may help include chamomile, ginger, and periwinkle. 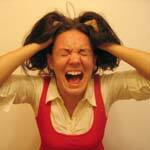 Over the counter medications may also be used to treat menstrual migraine headaches. These can include Ibuprofen, Relafen, Orudis, and other mild non steroidal anti inflammatory medications. These drugs block inflammation and pain sensations. Care should be used if these medications are taken frequently for migraine headache relief though, because they can be very hard on your stomach and can have side effects that cause discomfort or medical complications. If home remedies and over the counter medications do not provide migraine headache cures then you may need to see your family physician. A prescription drug may be needed to treat your menstrual migraine headaches when nothing else seems to work. Triptans may be prescribed to keep the blood vessels in your brain small and minimize the symptoms and pain you experience when taken at the first symptom. Ergotamines may be prescribed for treatment after the migraine has already started.